Can you believe it is over a year since some of you came to see my garden ? Time really flies by ! 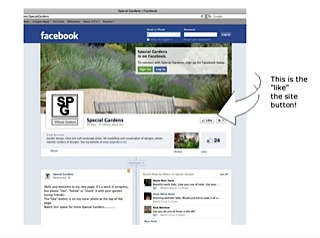 I wanted to let you know that I have created a page on Facebook for my garden design business ‘Special Gardens’. It has a few examples of my own garden designs, with before and after comparison pictures, some albums showing some of the works and some showing the evolution of the planting. It also has pictures of our garden in the making and of some of the plants and flowers. But it also has lots of photos, articles and links to all number of gardens and plants, both public and private, anything I think is of beauty or interest to garden and plant lovers. I also intend to have different features from time to time, such as "what's flowering in your garden at the moment" , "musings of a Provencal gardener" and mini competitions for best photos sent to me via the Facebook page. If you aren’t signed up for Facebook, as I said you can view it, it just means you can’t interact with the page, but if you are, you can “like” it, “share” the page, or just specific pictures that you like, either to your own page or to a friend‘s page, or you can “follow” it. I’m keen to get interaction, comments and likes etc, so please feel free to add things … and I may need help identifying some plants from time to time ! I remember how passionate you all were about gardens and gardening and I thought you might be interested to take a look. The page is in its infancy at the moment, but I will be adding to it as time goes on and would be delighted to hear from any of you, especially if you have any comments or suggestions of how I can improve it or make it more interesting. Please come and visit, you are very welcome ! PS if you want to “like” the page but can't work out how to do it, this is how !! This is a beautiful area. Take the road from Vidauban to La Garde Freinet. Look out for a turning to the left signposted Plan de la Tour. Not long after you pass a sign for the 'Reserve' mentioned above. We saw lots and lots of Anemone, some small wild Irises had already come out. I imagine in a couple of weeks it will be covered with Irises. In a few months it is the turn for the Cistus and Lavender Stoechas. I've never seen these shrubs growing in such profusion as there, it will be stunning.